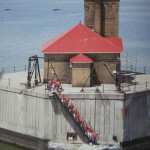 Lou Schillinger, a citizen of Port Austin, contacted the USCG Ninth District Commander as an individual in late 1984 to secure an “Occupancy License” for the purposes of stabilizing the station. During the years 1984-1989, Schillinger and his family, friends, and volunteers from Port Austin removed guano and undertook preliminary stabilization. 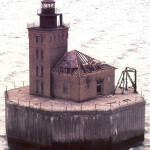 In 1988, many of those friends and residents formed the Port Austin Reef Light Association, Inc. (PARLA), an association dedicated to the restoration and maintenance of the Port Austin Reef Light Station. Mr. Schillinger served as its first president. In 1988 PARLA began making significant steps toward its goals. The original access ladder, located on the reef some distance from the light station, was reattached. Subsequently, all the steps that had been missing were located on the reef and reattached making convenient access to the lightstation possible. That year, Mr. Schillinger, with the support of PARLA, was able to extend the license to 2020. This allowed PARLA to manage and restore the property on Mr. Schillinger’s license until an organizational lease could be arranged. In order to maintain the license, the biggest task was to build a functional roof on the fog signal building. PARLA installed a roof truss system which closely matched the original historic roof pitch and profile. The roof is clad with historically accurate red metal shingles. PARLA has made many other significant improvements to the light station in the past 27 years. A safety chain around the structure was replaced, a new metal chimney installed, the lamp house and watchtower glass sealed, and ironwork painted. In 1990, sixteen windows were replaced: the two largest in the steam room and four in each room of the tower. New stairs in the entrance vestibule were installed, replacing a utilitarian stair that had been built by the USCG to replace the original unstable staircase. In 1991, custom made oak doors were installed. Unfortunately, despite efforts made to make access as limited as possible, vandalism has been a constant presence throughout the whole process. In 1994, a particular break-in resulted in damages to the ladder, windows and other equipment. Other small projects and adjustments have been completed during this “stabilization” period of the light station on an as-needed volunteer basis. 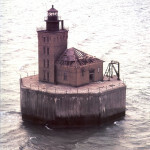 In May 2011, the USCG submitted a National Register of Historic Places nomination, which was approved in September 2011. Upon the USCG declaring the property surplus, the General Services Administration made the station available for ownership via the NHLPA, for which PARLA applied. Ownership of the light station was transferred under the NHLPA on February 1, 2013.